I want to introduce the stars in the picture. As you can see, there are 7 bright stars near the cherry blossoms. Guess what are they? 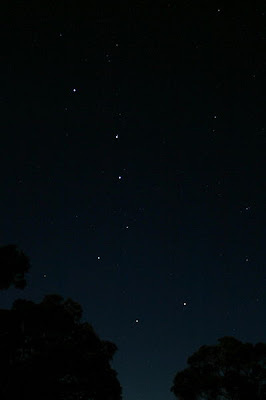 Yes, they are so-called “Big Dipper” and in Chinese are called ”北斗七星” and in Japanese are called ” ほくとしちせい”. 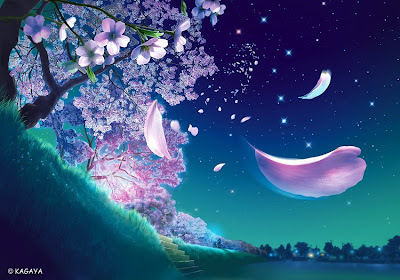 I think that the reason why the author put cherry blossoms and Big Dipper together is because that the Big Dipper is one of the important element to represent spring. Because the Ursa Major( which the Big Dipper in ) is one of the target of the spring night sky and the cherry blossoms are represent the spring scenery. The Big Dipper was very important in ancient China. Even every single star has its name. I have found the format on Wikipedia and it has the contrast between the Chinese name, ancient Chinese name and Proper English name. Actually… I have memorized all the Chinese names of those stars! If you feel strange and ask me why I done this, I would tell you that I just think their Chinese names are indescribable beauty… Every time when I read those magical-liked, glamorous names, I could not help but feel that I am in a peaceful mountain and the night breeze blow tenderly through my face and bring the calmness of heart, and when I raise my head, I could see the plenty of stars and Milky Way. I know it is difficult for most of people to feel as I feel. But I try my best to make sense and hope you can feel it. Another interesting knowledge of Big Dipper I want to share is: the relevance between the Big Dipper and four seasons which was record in an ancient China book: When the handle is pointing to east, it comes spring; When the handle is pointing to south, it comes summer; When the handle is pointing to west, it comes autumn; When the handle is pointing to north, it comes winter. And I find it also related to the four seasons wind directions in China. Isn’t it is an interesting and unbelievable coincide? I wasn't prepared to leave a commend at first, but I have the urge to tell you that--I feel exactly the same about the Chinese names of the stars!! The ancient ones sound just AMAZING! They give me a sense of...ancient.. charm....( what am I talking about?@@?) I actually don't feel much toward the picture, I prefer real ones. But their names are simply attractive! I am so glad that I finally find someone who have same feelings with me!!!!!! It's really difficult for me to describe that feeling... Chinese is really a charming language, isn't it? It seems has magic to raise our inner sense of beauty and pleasantness. When it accompany stars which are one of the most beautiful element in the night, it becomes more powerful to make our heart tremble... ooooh am I too excited? Not at all, I think you get the indiscribable feeling! Yeah, they do raise something beautiful and graceful in our heart and, you got it, make our heart tremeble!